In all honesty, I was skeptical about this movie. I’ve seen books like Crazy Rich Asians before. To me, books about rich people are all about first world problems and backstabbing melodrama better suited for a reality show. The answer was Constance Wu as Rachel Chu. In the eyes of me, a typical American millennial, Rachel has it made. She teaches economics at NYU and has never been East of Queens. And while I was scared that I would be pulled into a world of snobs and hypocrites, Rachel, Nick, Colin, and Araminta were able to take me along for the ride. The scene of the four of them checking out the open market, eating local food from the vendors, and driving around the city made me think: Yep. These are my people. Awkwafina’s Peik Lin stole the show numerous times. She’s a mix of Janis Ian from Mean Girls and Tim Gunn from Project Runway. Ken Jeong was hilarious as well, with his Elvis impersonator-esque outfit. The juxtaposition between the comical family and the gaudy house they lived in was a hilarious sight. Gemma Chan’s Astrid also won my heart by being the only one in Nick’s family to connect with Rachel. Shopaholic she may be, but she’s a sweet woman who never let the lifestyle she was raised in get to her. It helps that her actress was in Doctor Who and Sherlock. She has a subplot in this movie that centers on her marriage falling apart and she delivers a line to her soon-to-be ex-husband that deserves to be right up there with Hamilton’s “Burn” in terms of awesome breakup lines that will go down in history. There were a lot of small moments that resonated with me, aside from the street food scene: families doing perfect poses for pictures, the numerous amounts of cooking scenes (which made my mother hungry for dumplings), and the social media gossip that ends up at Eleanor Young’s Bible study. I even had a visceral reaction when Nick’s old girlfriend acted all catty to Rachel. Asian Caroline Bingley, that one. What’s interesting to me about this movie is that while I can relate to it to a certain extent, I also have some emotional distance from it. Like Peik Lin said, I am a “banana.” I am more American than I am Asian. Of course, my heritage is Filipino. My mother, however, was able to relate to a lot of it. Being Filipino is very different from being Chinese or Japanese, even if you throw in Asians from Hong Kong and Malaysia. Filipinos have mixed Spanish and American culture due to being a territory of both cultures. Even now, Filipinos act more like Americans than their more traditional counterparts. 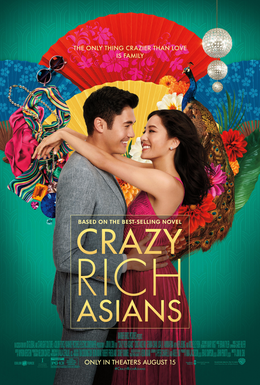 This movie made me question my identity for a bit, as I realize that I have no idea what it means to be Asian. At the same time, though, I realize that my ethnicity is just a part of my identity. And in the end, seeing this movie helped me to realize that aspect of myself. Crazy Rich Asians may not be a perfect picture of Asian representation, but it’s definitely a start. I hope that in the future, there will be more movies with Asian leads. Also, it, along with Set it Up and To All The Boys I’ve Loved Before is definitely bringing the romantic comedy back and making it more than just a punch line. Romantic comedies are something to take seriously now because even in a story about uber-rich Asians, they are stories we can relate to.